3- Year girl. 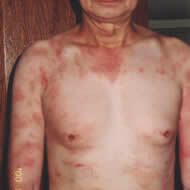 Had severe Atopic Dermatitis. My daughter had atopic dermatitis all over her body. I applied some ointment for her. But since it gets itchy, she had scratched her skin. I consulted with many doctors. They advised me not let her to take the shower too often since shower makes atopic worse. Since a year ago, my atopic dermatitis had become very bad. I consulted 6 doctors, but nothing was helped. Also, I had to take stronger medicine, and it affected bad for my liver function. Therefore, I tried to use Pi Products (Bio Kyss Shower, Pi Seigen and Skin Revitalizer). Then, the next day started using Pi Produts, the atopic looked worse. However, I was advised it is the reaction before it would be better. So, I trusted and kept using. Then, after 2-3 days, it was getting better, and two weeks later, my skin was looked much nicer as you see in the picture. I was so surprised, too.